Q4D #2: Only Idiots Believe the Bible? Last time, I talked about the doubt whether belief in Jesus is on par with belief in Santa Claus and the Easter Bunny. Today I want to turn our attention to the Bible. The Bible was written over 1500 years by more than forty different authors of all kinds–generals and statesmen, shepherds, kings, a medical doctor, tax-collector, fishermen and scholars; in 3 languages–Hebrew, Aramaic and Greek; on 3 continents–Asia, Africa and Europe; in the desert, in palaces, dungeons, prisons and on the road; in war and peace; in the heights of joy and the depths of sorrow. It’s safe to say no book rivals the Bible in its influence in Western Civilization or indeed on the affairs of the entire human race. But am I an idiot for believing the Bible is true? Is it blind, unreasoning faith and gullibility? Hasn’t the Bible been proven false over and over again? We don’t see miracles and resurrections happening today; we don’t hear God speaking out loud; He doesn’t send prophets anymore. Isn’t it naive to believe this stuff? Isn’t it circular reasoning to say we believe it because “the Bible tells me so”? Worse is when people say they believe the Bible because of how it makes them feel inside, or because of some rumour of a modern-day miracle, or because it’s popular, or that a celebrity believes it, or worse yet when someone is afraid some new discovery might finally prove the Bible is all a lie. Serious doubters can’t understand how Christians can give intellectual assent to the idea God expects humanity to find Him in some book. So here’s the problem as I see it: we Christians believe the Bible is true, that it is God’s Word. If we believe this because the Bible says so, we don’t have a logical reason; it’s circular–our reason assumes the truth of our conclusion. Worse yet is when we believe because other people tell us to, or because a bunch of theologians have proved the Bible with evidence. That kind of faith can quickly become the kind that closes our eyes and plugs our ears against reasonable questions and new discoveries or evidence in the sciences and archaeology: It’s anti-intellectual. And then no wonder Dawkins and others like him think Christians are idiots for believing the Bible. But it doesn’t have to be that way: faith doesn’t have to be circular or anti-intellectual, blind or deaf. One can start by testing the Bible as a record of history. So I have two questions for serious doubters: have you checked into the reliability of the Bible as history? And have you checked out the reliability of our copies of the Bible? An archaeologist I read about the other day told a story about a famous mentor, I think, who once heard a younger colleague bashing the Bible while on a dig in the Canaanite city of Gezer. The older archaeologist rebuked him warning, “Well it just has a habit of proving to be right after all.” To illustrate that point, he shared two other stories: one about an archaeologist named Nelson Glueck who specialized in places mentioned in the Bible and discovered 1500 sites that confirmed the Bible’s historical accuracy. Glueck once said in a lecture, “I have excavated for 30 years with a Bible in one hand and a trowel in the other, and in matters of historical perspective, I have never yet found the Bible to be in error.” The second story was about archaeologist, Professor G. Ernest Wright of Harvard University, who for 30 years had taught that the Bible was wrong about Moses, the books we believe he wrote, and the time of the exodus of Israel from Egypt. Then after discoveries were made that confirmed the Bible was right after all, that Harvard professor confessed, “I’ve had to admit that I was wrong.” Another scientist, Dr. Bryant Wood, has shown that likewise the city of Jericho appears to have fallen at about the time when the Bible says it did, which critics had long said was impossible. Dr. Joseph Free, in Archaeology and Bible History, concludes: “Archaeology has confirmed countless passages which [were once] rejected by critics as unhistorical or contradictory to known facts.” There are a whole bunch of details in the Bible critics have long said were untrue, but many of those old doubts have been overturned and the Bible confirmed. Harvard archaeologist, Dr. William F. Albright says, “The excessive skepticism shown toward the Bible by important historical schools of the eighteenth and nineteenth centuries, certain phases of which still appear periodically [today], has been progressively discredited.” One scholar, Sir William Mitchell Ramsay, set out to disprove the Bible with archaeology and ended up finding the Bible was accurate, and finally put his faith in Jesus. So what about the reliability of our copies of the Bible? The authenticity of the New Testament is far greater than any other ancient manuscript. No one doubts, for example, that the version we have today of Plato’s writings are basically authentic. Yet we only have 7 ancient copies, no originals, and the oldest copy we have was made 1200 years after the original was written. Likewise with Caesar, Aristotle, Tacitus, Herodotus, Thucydides and so on: a few copies, at least a thousand years after the originals. But there exist today more than 5700 ancient copies of the New Testament documents in Greek (another 10,000 in Latin) that verify the authenticity of the one I’m holding. And the oldest manuscripts are between 25-55 years after the originals! There are 10-15 copies within 100 years; 4 dozen within 200 years; 99 copies survive from before 400 AD, including a complete edition of the whole NT, the Codex Sinaiticus! With the discovery of the Dead Sea Scrolls in 1946, we have copies of biblical books dating to only a few hundred years after some of the originals, giving us an amazing snapshot: taking the Hebrew Bible editions in use in the 20th century, like the Leningrad Codex, and comparing it with the Dead Sea Scroll manuscripts, we find that significant variations affect less than 1% of the text of my ESV Bible for example–and those are documented in the footnotes in these pages. And of even those variations, none of them change any point of doctrine at all. If the Bible was any old secular book, no scholar would doubt it. As FF Bruce said, “…there are people who regard a ‘sacred book’ as ipso facto under suspicion, and demand much more corroborative evidence for such a work than they would for an ordinary secular or pagan writing.” People don’t doubt the Bible because it’s unreliable, they doubt it because they don’t want to believe it might be true. The Bible invites readers to test and see whether its prophecies come true and see what verdict we come to. Prophecy accounts for about ⅓ of the whole Bible. God actually dares skeptics in passages like Isaiah 41:21-23, and Isaiah 46:9-10… the Bible contains numerous prophecies of things that would happen, verified predictions that happened: Babylon destroying Jerusalem, the Jews returning later on to rebuild the city and temple, even the name of the king who would let them go (at least 100 years beforehand! e.g. Isa 6:13; 44:28). The rise and fall of four world empires, in order, with impossible details, fulfilled over a timeline of at least 1200 years after the prediction was made–the rise of Babylon, Medo-Persia, Greece and Rome, and the breakup of Rome into the the present makeup of Europe (Dan 2, 7). These prophecies profoundly affected my faith when I first learned about them. Examining what was predicted and comparing them to history, I saw there could be no other explanation than that God revealed had the future. Gen 3:15 predicted the Messiah as “the seed of the woman; the Messiah will be born into a human family, and with no human father. Gen 12:1-3 predicted the Messiah will come from the line of Abraham. Gen 49:9, 10 that the Messiah will come from the tribe of Judah. 1 Chron 1:24 that the Messiah will come from the line of Shem. Isaiah 11:1, 2, 10 the Messiah will come from the family of Jesse. Isa 7:14, the Messiah will be born of a virgin. Isa 9:6, 7; 16:5, the Messiah will be the heir of King David. Micah 5:2, the Messiah will be born in Bethlehem. Psalm 22:14-18, the Messiah will be crucified. Psalm 16:9-11, the Messiah will be raised from the dead. Dan 9:24-27, the Messiah will fulfill prophecy, expand and confirm God’s covenant with Israel, make an atonement for sin, be killed and rejected by the Jews, specifically within 490 years from a decree of the Persian king Artaxerxes in 445BC. All these things came to pass and Jesus was crucified 484 years later, right on time. Last week we took a hard look at whether Jesus was a liar, a lunatic, a mere legend or actually Lord and God, and we saw that even though it’s hard to believe, it’s harder to deny the evidence–it’s reasonable to believe Jesus was who He said He was, who the New Testament writers claimed He was. And when we look at what Jesus believed about the Bible itself, we see over and over again that He believed it is God’s Word–He even mentions as true events some of those events that are hardest for doubters to believe: the creation of Adam and Eve, Noah and the global flood, the destruction of Sodom and Gomorrah, Lot’s wife, Mannah in the wilderness, Moses and the bronze snake, Jonah and the whale, that Moses wrote Genesis through Deuteronomy, and that Daniel wrote his amazing book. Cambridge scholar, FF Bruce, who taught at the Universities of Edinburgh, Leeds, Shefield and then Manchester, pointed out that though Jesus was critical of how the Jews had turned the true faith into a religion of rules, He agreed with them that the Bible is God’s Word. If Jesus bears witness that the Bible is God’s Word, it’s not circular reasoning– if in fact there are good reasons to believe the Bible is a reliable historical record of what He said, and that the Bibles we have are reliable copies. It’s not circular to accept Matthew’s high view of Genesis (Mat 19:3-6), or Paul’s on Luke (1 Tim 5:18), or Peter’s on Paul (2 Pe 3:15-16). Once we move from accepting the Bible as reliable, we have to begin to wrestle with what the Bible openly reveals about who God is and what He has done. God has acted and spoken in history to make Himself known to humankind. And the Bible makes God known to us as we read and understand its message. I know atheists who reject the Bible because they reject the possibility that God exists, even sometimes using circular reasoning without any evidence to shut God out. But if someone is not closed off to the possibility of God’s existence, then the things we read about in the Bible, like miracles and resurrection, are not only possible, they are inevitable. If God exists, and if He cares about His creatures as the Bible shows, doesn’t it make sense that He would show Himself, reveal His power and love, intervene supernaturally in history, even come down to our level in human form, save us from our own rebellion against Him, and pave the way for a better future one day? I can’t convince you to love the Bible as God’s Word like I do. I can’t change how you feel about it. But I do hope you’re beginning to see that Christian faith doesn’t have to be opposed to rational, thoughtful inquiry and learning. I’m even hopeful that perhaps you might question some of your doubts to see if they are as strong and convincing as are some of the reasons for accepting the Bible as a reliable witness of what God has said and done to make Himself known to us through Jesus. 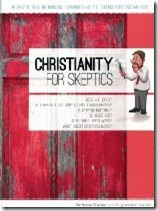 Steve Kumar and Jonathan Sarfati, Christianity for Skeptics, (Creation Book Publishers, 2013). Jonathan Sarfati, “Presuppositionalism vs evidentialism, and is the human genome simple?”. Creation.com, [http://creation.com/presuppositionalism-vs-evidentialism-and-is-the-human-genome-simple] Accessed September 16, 2014. Carl Wieland, “Archaeologist Confirms Creation and the Bible”. Creation.com, [http://creation.com/archaeologist-confirms-creation-and-the-bible] Accessed 9/18/14. “The Number and Antiquity of NT Manuscripts Compared with Other Ancient Literature” in The ESV Study Bible (Crossway Books, 2008), 2587-2588. “The Reliability of the Old Testament Manuscripts” in The ESV Study Bible (Crossway Books, 2008), 2585-2586. Josh McDowell, Evidence that Demands a Verdict (Campus Crusade for Christ International, 1972). David Limbaugh, Jesus on Trial (Regnery Publishing, 2014). Kumar and Sarfati, Christianity for Skeptics, 112. Jonathan Sarfati, “Presuppositionalism vs evidentialism, and is the human genome simple?”. Dr. Clifford Wilson in “Archaeologist Confirms Creation and the Bible”, by Carl Wieland. Albright, W.F., The Archaeology of Palestine and the Bible, Revell, NY, p 127, 1935. Quoted in Kumar, 123. Kumar, 118. Also see “The Number and Antiquity of NT Manuscripts Compared with Other Ancient Literature” in The ESV Study Bible. See ESV Study Bible, Ibid. “The Reliability of the Old Testament Manuscripts”, ESV Study Bible. e.g., McDowell, Josh, Evidence that Demands a Verdict; Lee Strobel, The Case for Christ; David Limbaugh, Jesus on Trial. Dehoff, G.W., Why We Believe the Bible, Dehoff Publications, Murfreesboro, TN, p. 14, 1974. Quoted in Kumar, p. 111.